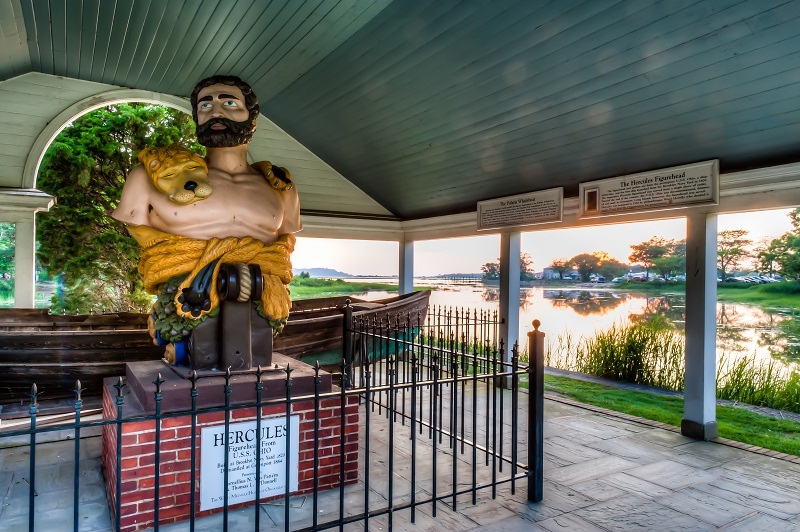 Overlooking Stony Brook Harbor, the Hercules Pavilion on Main Street, Stony Brook, houses the figurehead and anchor from the prestigious U.S.S. Ohio, the first ship launched from the Brooklyn Navy Yard in 1820. Toward the end of the century, the U.S.S. Ohio was decommissioned, destroyed and sunk in Greenport, Long Island. However, the figurehead was saved. The massive bust was first sold for $10 to the Aldrich family of Aquebogue; then to Miles Carpenter, owner of the Canoe Place Inn in Hampton Bays for $15, where it remained for decades. The figurehead was acquired by Ward Melville in 1954, who deeded it to The Ward Melville Heritage Organization for preservation. It is said if you kiss the brow of Hercules, you’ll be married within a year. Sharing the Hercules Pavilion with the historic figurehead is the Polaris whaleboat, thought to be the only surviving artifact from the Charles Hall expedition to the Arctic in 1870. Commander Robert Peary recovered the Polaris during his 1905 Arctic expedition and subsequently placed it with the American Museum of Natural History in New York. Some forty years later, naturalist Robert Cushman Murphy was instrumental in transferring the Polaris to Ward Melville. It is now a property of The Ward Melville Heritage Organization.